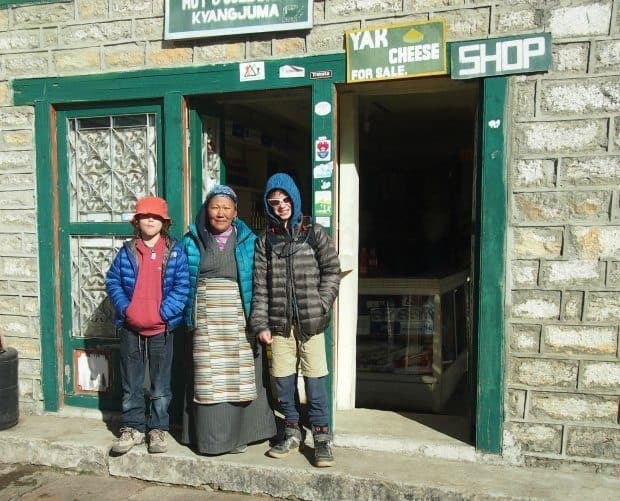 On our return trek from Tengboche Monastery we took a different route to Namche Bazaar to take in some important locations and stunning Himalayan view points. 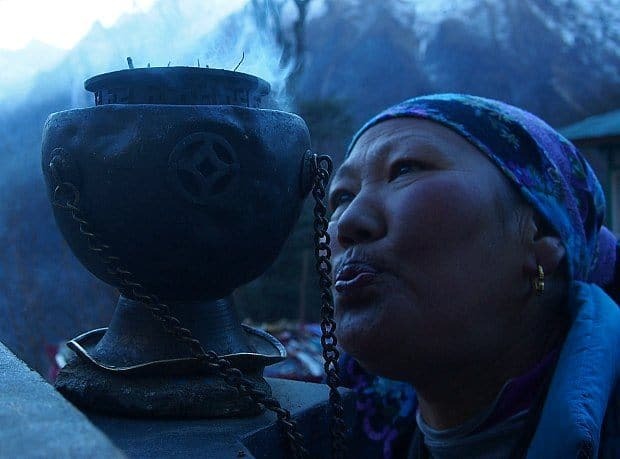 A major highlight for us was being granted admission to the ancient monastery at Khumjung and being allowed to see a fascinating sacred relic kept under lock and key. 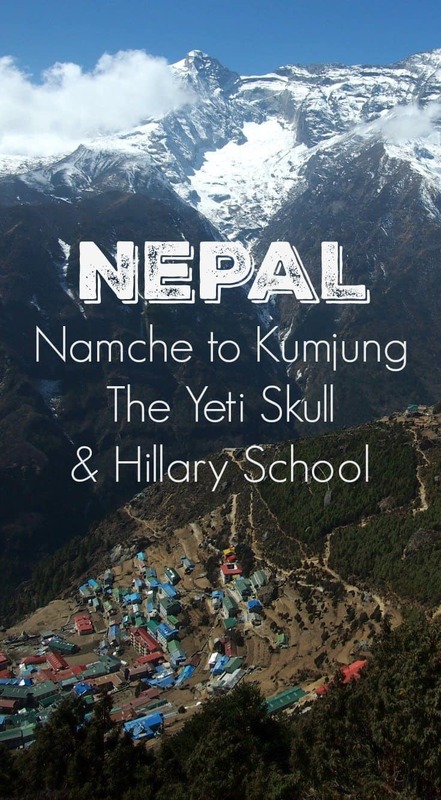 Khumjung Village itself is also well worth a look as is the famous Hillary School. 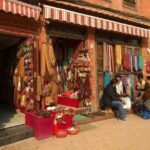 If you’ve skipped other posts about our first trek in the Everest region, you may want to go and read about the white knuckle flight from Kathmandu to Lukla and part one of the trek, to Phakding, Namche Bazaar and Tengboche Monastery. 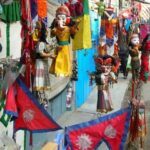 If you looking for a Nepal travel guide it’s here or our first post on the Everest Base Camp Trek, it’s difficulties, we have that too. After our first brief glimpse of Everest through rushing snow clouds at Tengboche, we turned back towards Namche but via a different route. The kids were small then and we’d only headed to the Himalayas for a walk that time, we hadn’t planned on going all the way to Base Camp. This route took us into Khumjung Village, a million miles from the busy EBC trekking route. Chef and I strolled back along the path before breakfast and were rewarded with stunning views. Everest range centre, sadly over-exposed, I had camera problems. Leaving Kyangjuma in the morning, headed to Khumjung with the school kids rushing to their desks. The morning after my son and I took the day trek to Tengboche the clouds had finally vanished and the sky was blue and clear. 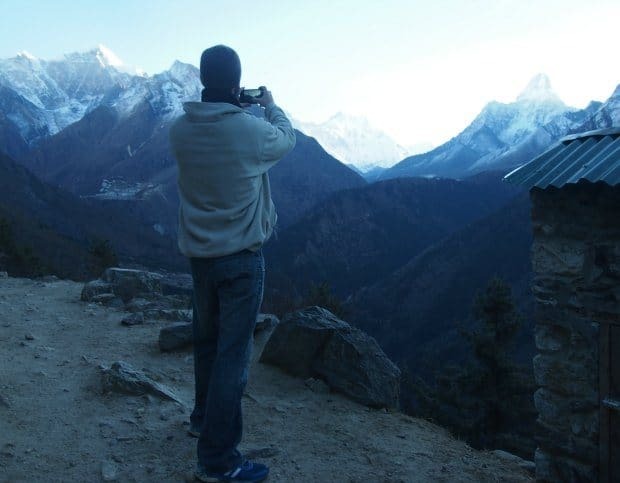 Chef and I wandered back along the trail after breakfast to take in the early morning view of Everest, Nuptse and Ama Dablam. The images below don’t give those incredible mountains justice. The view was breathtaking and continued to be perfect all day. I should never have worried about not seeing my mountain. 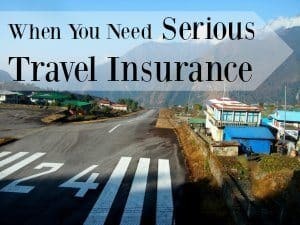 Best Blog Read Now! 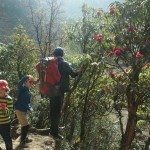 Nepal Trekking Gear. What to Wear, What to Take? The village of Khumjung was up a bit. Everything in the Himalayas is up a bit, down a bit, we needed to get up to 3,790m at Khumjung before a little more up to 3,900 and the final steep descent through Syangboche to Namche Bazaar at 3,440m. We started our trek that morning at Kyangjuma ( altitude 3,600m) around the same time as the local children were heading to school. Scampering Nepal kids surrounding us as we plodded up the hill. This loop from Namche to Khumjung Village and back could easily be completed in one day, but because Boo wasn’t feeling too good our Sherpa guide had only let us walk two hours the day before on a fairly flat, easy trail. 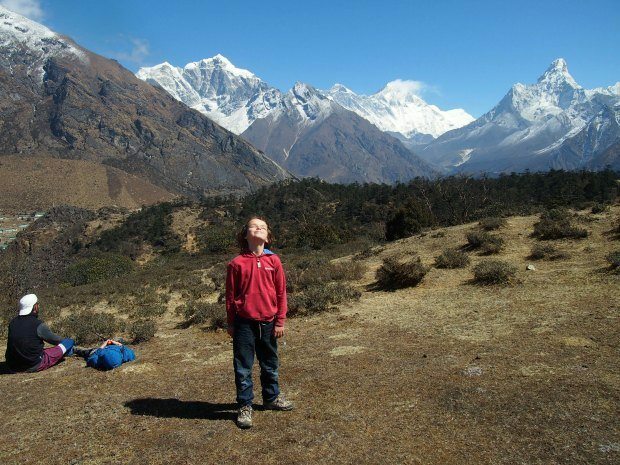 It got him a little closer to Everest so that D and I could visit Tengboche as a day trek the next day. Chef entering Khumjung Monastery. Just to prove we had backpacks. 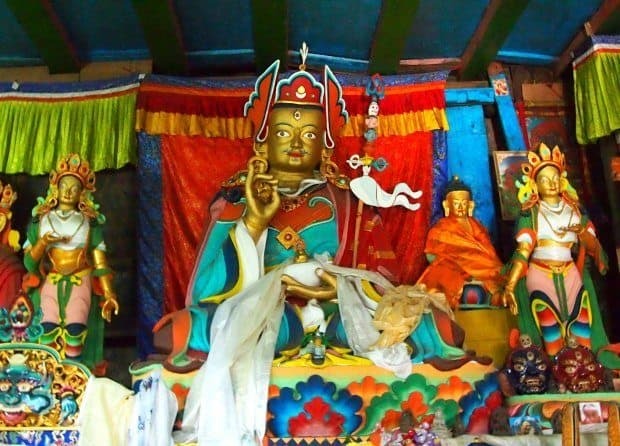 Kumjung is considered the Sherpa capital of the Solukhumbu region and is a fairly large town by mountain standards. We picked our way between potato fields on paths only used by yaks to visit the beautiful monastery. 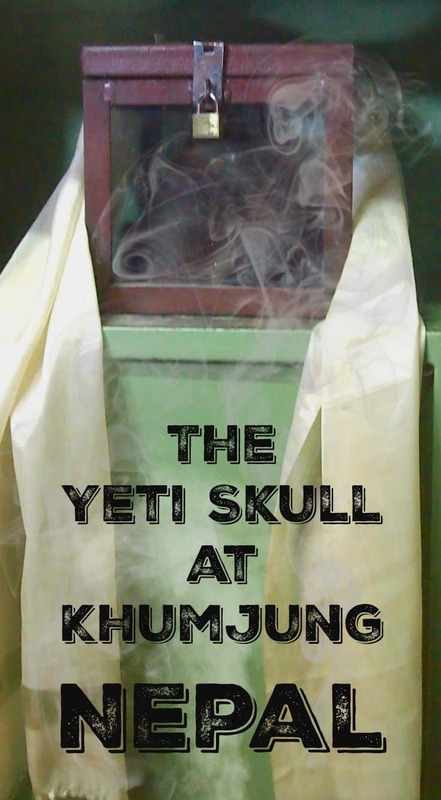 Some believe yetis are real, some don’t, whatever, there was no way we were going to miss out on a chance to see this relic. Come on, we’ve got kids, this is a big wow! 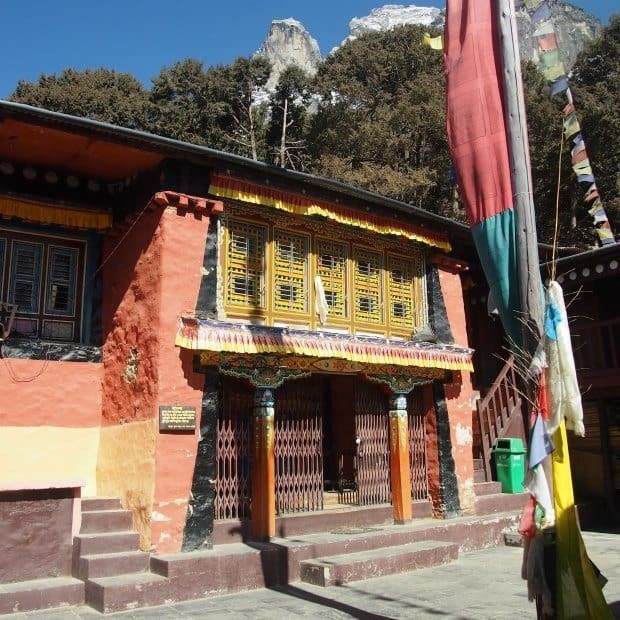 We arrived at the monastery, spinning prayer wheels as we passed the mani wall to find the doors locked. Nema vanished to find the monk with the key, leaving us watching women harvesting potatoes in the field below, just about the only thing the Sherpa people can grow up here. Best Blog Read Now! Everest Base Camp Trek Difficulty and Hardships - How Hard Can it Be? The courtyard at Khumjung Monastery, through the first locked door. From the monastery we continued towards Namche through the Hillary School and past the airstrip at Syangboche. 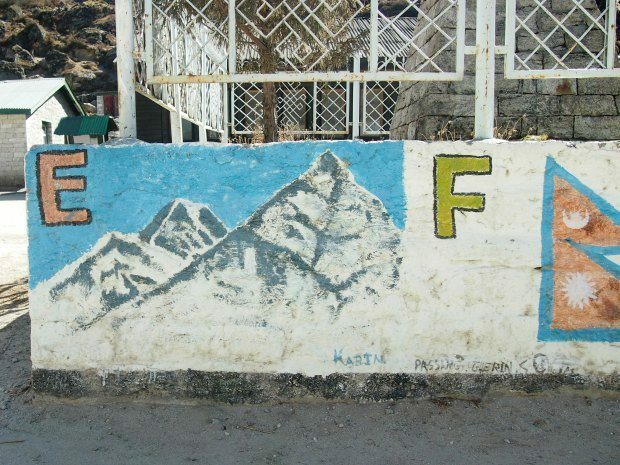 This is the landing patch that was mostly used by Everest expeditions, but these days supplies are being brought up by land with devastating destruction of trails and forests below Lukla. More on that in a later post. 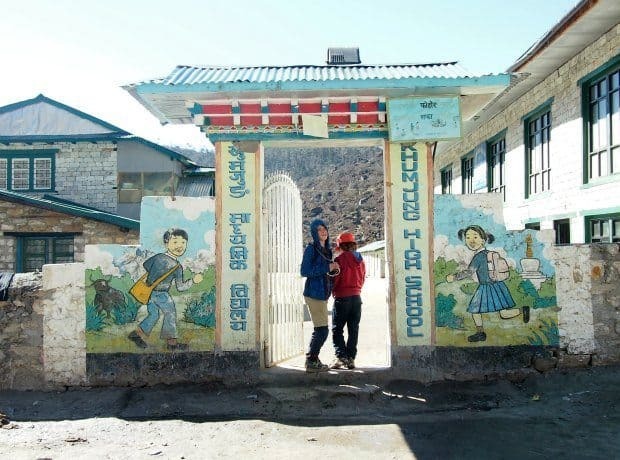 School time at Khumjung. The Hillary School. The closest my boys are likely to come to school. 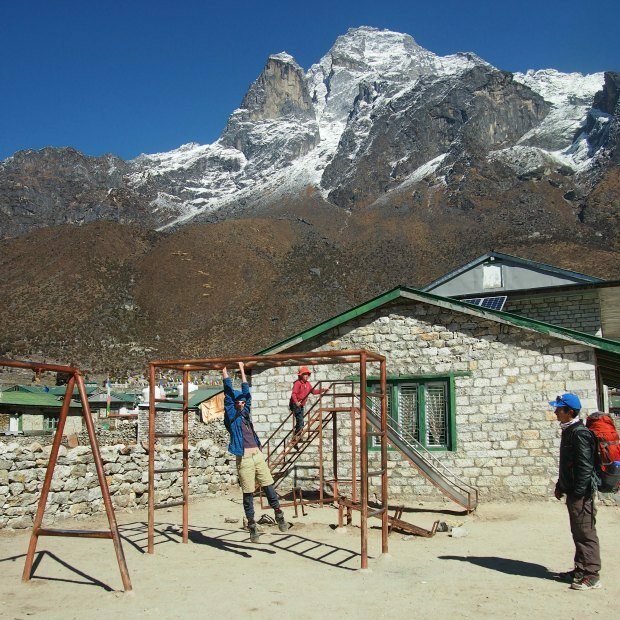 Playing at the Hillary School, Khumjung, under Nema’s watchful eye. Up here is the Everest View Hotel , the highest hotel in the world at an altitude of 3962m. We can promise you the views are worth coming for. If you were to walk direct from Namche to The Everest View it would probably take you 1-2 hours of steep up-hill with many stone steps. 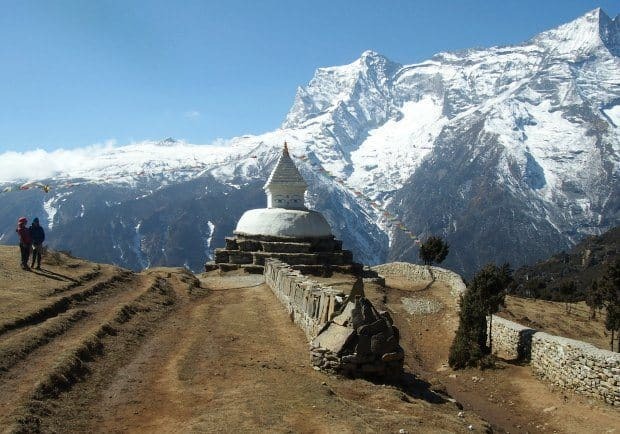 This is the classic acclimatisation hike from Namche. Boo loving the sunshine, the freedom to run and those incredible views. Above Khumjung, Everest behind. The kids still run jump and play, they were far from exhausted. 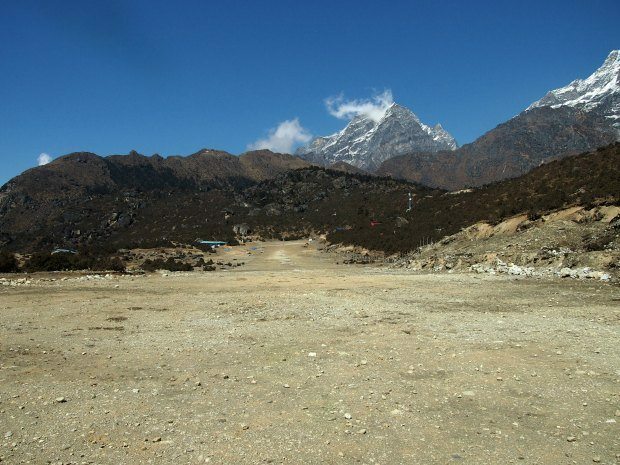 Sayangboche airstrip. Now largely disused is above Namche on the way to Khumjung. We saw huge helicopters landing here in 2018. The highest point between Kumjung and Namche Bazaar, a fraction off 4,000m. Everest view behind and Everest View Hotel down and to the left ( not seen). Starting the descent to Namche Bazaar. This stupa has now been repainted and the beautiful blue eyes have gone. The local weather station is to the right, not seen. The descent to Namche is incredibly steep and largely consists of high stone steps. It’s a little treacherous and very hard work to climb if you’re heading in the opposite direction. Every picture on this page was taken on one fabulous day. It’s hard to believe, just a few hours of walking and we saw so much. Next we had to get back to Lukla from Namche. That walk is possible in one tough day and involves crossing that terrifying bridge again. 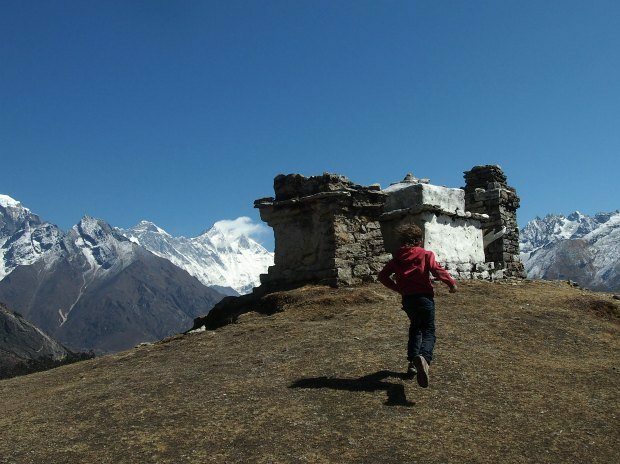 From Lukla trekkers can fly back to Kathmandu or walk out, extending their trek by at least 3 days. We chose the latter option this time and, maybe, regretted our choice. 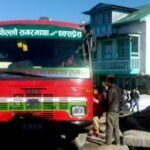 That descent to Phaplu will be in our next post before we share the scariest bus ride in the world, Phaplu to Kathmandu. 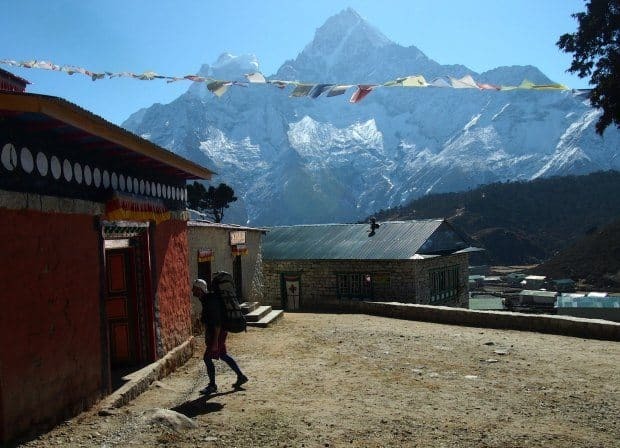 Khumjung Village itself is well worth a look, you can even make Khumjung an overnight stop on your trek. It’s a little off the main EBC trek route and not nearly as populated with trekkers and the commercialism they bring. Further along the trail, near Pangboche, another monastery holds a yeti hand and skull, this one can also be visited as a side trek. 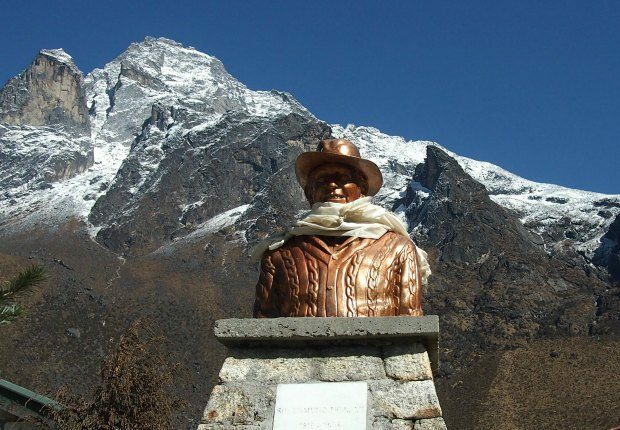 If you just want to quickly visit Khumjung you can do this as part of your acclimatisation walk to the Everest View Hotel. 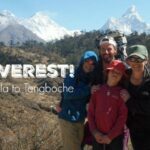 Most trekking groups and guides will take you to the Everest View Hotel and it gets incredibly crowded in peak season. 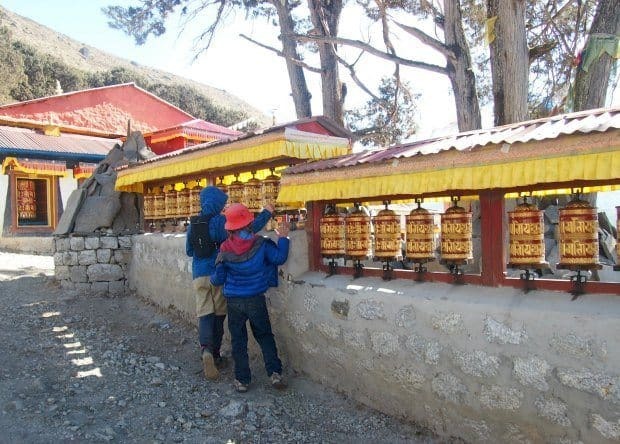 Not so many extend their walk to visit Khumjung and neighbouring Khunde. Nepali flat 🙂 Boo looks great in those photos, think rest did him good. Great, that you all had a fun time. Looking forward to more stories. Great pictures too, Thanks for sharing.